Some years ago my husband planted trees all over our back yard in Spokane, WA, turning it into what I called a Zen garden. There was shade on hot summer days, beautiful snowy branches in the winter, and a magnificent fall to rival colorful leaves any other place on earth. One of my favorite things to do on cold winter mornings was to check out in the front yard for deer hoof prints in the snow. A few years ago one Christmas Eve, daughter, husband and their little son, Asher, who was four at the time, were visiting. We decided we all needed a short walk in the snow after dinner. Asher spotted deer hoof prints in the driveway and insisted they were reindeer hooves from Santa’s sleigh. He was insistent on going back in the house so he could go quickly to bed, in the hopes that Santa would be back with his reindeer to leave toys, of course. Even when I did not know how much I loved living in the Pacific Northwest, it continued to grow on me, especially the River Birch I loved so dearly. The peeling leaves of the trunk filled me with wonder every summer, as it grew more stately, sending long branches over the neighbor’s fences every fall. After living in the Pacific NW for over 30 years, my grown son and daughter finally talked us into moving to GA to be closer to daughter and her family. We moved in September after months of careful planning which included selling our house in January, a Georgia house hunting trip in April, signing papers on a new house in June, and moving in September. We told friends goodbye and climbed into the car with conviction in our hearts for the trek across the country from Washington State, land of the ever greens, to Georgia, land of the peaches. I knew I’d miss lots about the Pacific Northwest, including the pristine rivers my husband kayaked, but I had no idea how much the magnificent river birch in our back yard meant to me until one day in Georgia when I stopped at a nearby shop where my Honda Civic was being repaired. The mechanic and I chatted briefly and he asked me where I was from. “Spokane, WA,” I told him. He had family there and asked, “What was your zip code there?” Without warning I burst into tears – big, racking, sobbing tears. I could not speak other than to mumble through my tears, “I am sorry, I am so sorry. ” He grabbed a box of Kleenex and shoved them towards me with a worried look on his face. 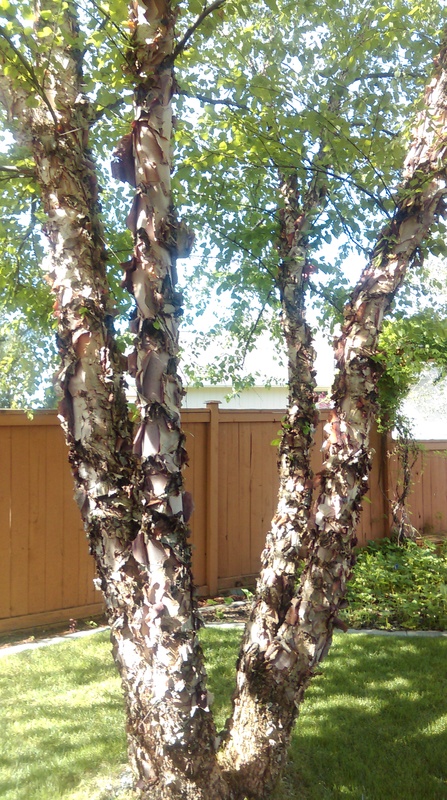 When I could speak I said, “I didn’t know that asking what my zip code had been would trigger such tears.” Then I told him, through more tears, how much I loved my beautiful river birch in our yard in Spokane, and that I would never have another one like it. I told him I realized in that moment that I had been grieving that magnificent river birch, and felt almost as if I’d left a child behind. My husband came into the shop as I was in the middle of my tears. He told me later he had no idea I had missed our river birch so much., then drove me to a beautiful plant nursery in a nearby Georgia town and bought us a new strong, stately river birch that is now in the center of our front yard. It will be full of leaves and glorious in no time at all, but it will never be the same. It will be a beautiful river birch, in Georgia, but it can never take the place of our beautiful tree in Spokane. One day it’ll all be OK, but it will never be the same. What I know now is that some memories will always die harder than others, and this is one of them! When people ask why we moved to Georgia from Washington State, we tell them, “Daughter and grandson in Georgia.” This explains why we moved. But it can’t begin to explain what we left behind, and that is a deep, abiding love for the Pacific Northwest, with quail walking along the top of our fence in the back yard, robins nesting in the rose trellis outside my office window, and those rivers clean and clear to the very bottom. We feel blessed to have been part of the Pacific Northwest for as long as we were there. We now have cardinals, mourning doves and blue birds at our feeder in the back yard here in Georgia, but not one quail has crossed our path, we have not seen one wild turkey, and ducks and geese, honking overhead and flying further south in the fall, are few and far between. The weather here is basically warm all winter, compared to freezing temperatures in Spokane, yet I long for days when I could wrap up in my winter parka, furry mittens, hat and snow boots to trek down to the mailbox on the corner. Usually I’d spy quail or wild turkeys on the way. Always there was the sound of snow crunching underfoot. I miss the sounds of snow blowers in driveways, miss seeing men red in the face from plowing, and mail trucks that are late due to the latest large snowfall. I miss finding the first Johnny Jump Ups and Pansies in the Spring, and the first tulip bulbs poking their heads through the soil. Even those deer hoof prints outside our dining room window make me misty eyed to remember. But we go on, old school as we are. Making do. Living here to watch our grandson play Georgia hockey and soccer, to help my daughter with her busy schedule when needed, and so much more. I tell myself analytically that I need people around me, that the trees and birds I loved so much never actually talked to me, but on quiet mornings when alone, I know deep down that they did. They taught me a lot of things I needed to learn about living, learning, and blooming where I am planted. Now, with any luck at all, my new river birch will teach me about letting go.